The German weather has very bad press worldwide. Most people think that is all rain, cold and gray clouds but these are just stereotypes. (Read here about other German misconceptions). So what do locals do? They fight the hot summer with water! There are 8 outdoor pools in Munich. They open between 9.30am to 20pm and the entrance fee is around 4-5EUR. Sounds like a good plan? It is a great plan... for a family with kids but if you are looking for a quiet, relaxing day by the pool, sunbathing and taking occasional dips, then the outdoor pools in Munich are not a good choice for you. The reason? They are overcrowded and conquered by kids. Firstly you wait 15 to 20 mins in line to access the facilities, then the real struggle begins: finding a free spot for your towel… if you’re lucky and find one, it is probably surrounded by a group of teenagers or a family with seven kids… and when you want to cool down and take a dip… then you’re risking your life because those teenagers have taken over the springboard and pool toboggan and they are splashing and dive bombing everywhere! This is a photo of an empty pool in Munich. You will never see one. the rest of the time all pools are overcrowded! 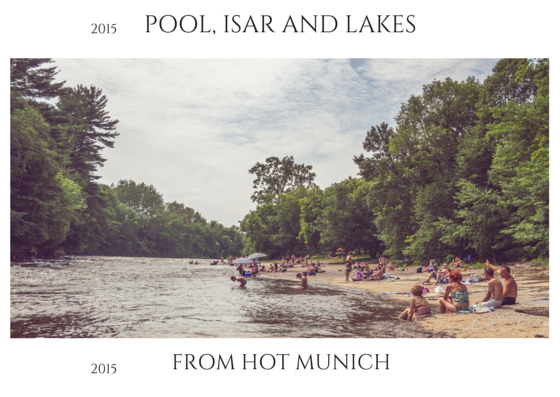 The riverbanks of the Isar are a great option to enjoy the summer in Munich. There are areas taken by the student community; popular spots for sunbathing, taking a dip or even barbecue and of course a few places where everyone is naked. Some are green areas, some have sand but there are beaches with small stones so plan accordingly. The Flaucher and the Eisbach sidebanks are my favorites. This is an official video taken by the city Munich about what's going on in the Flaucher area. 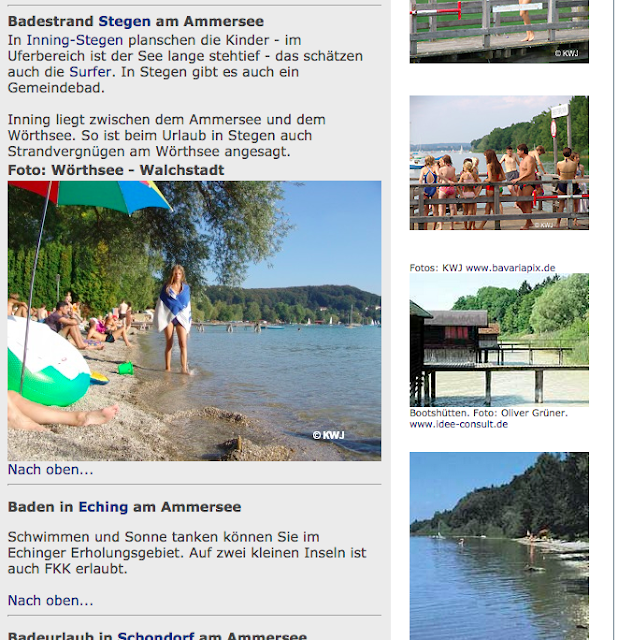 Here you can find the official map where “Baden” is allowed in the Isar. Did you think surfing in the river was crazy? This year I've learn that there is something crazier but also typical of Munich: jumping into the river and get swept along downstream until certain point, then get out, take the tram back and do it all over again! I don't think many people know about it because firstly it is not allowed (and therefore it's not openly promoted) and secondly it is sort of dangerous. People jump into the Eisbach, well.. mostly teenagers, right after the surfing spot where the water adventure begins and goes for one kilometer until Tivoli Straße where they get out (somehow) and take the tram back. Here you can read more about it (in German sorry!). Just remember if you decide to try it, it will be at your own risk, as the German sign alerts: “Baden verboten, Lebensgefahr” (Leben means life and Gefahr means danger, you get it, right?). Ammersee is the third largest lake in Bavaria. It’s located around 40 kilometers south west to Munich and it’s very easy to reach with the S-Bahn: line S8. The stop is called Herrsching which is the last one. Tegernsee is probably the most popular lake amongst the expat community in Munich. Why? Because of its amazing sandy beach. 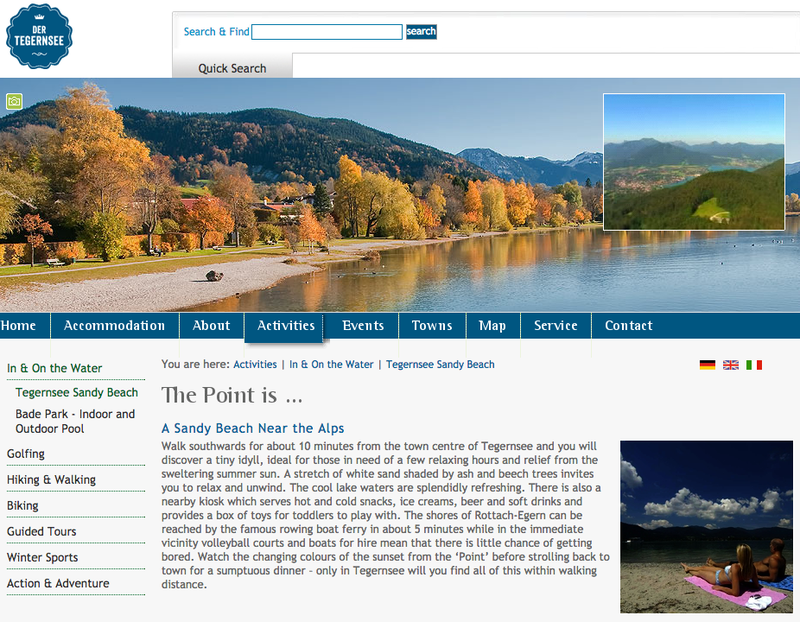 Tegernsee is located 50 kilometers south to Munich and is easy to reach by train with BOB (yes, BOB is the name of the train line that takes you to Tegernsee). Of course the usual: sunbathe, take a dip, picnic, etc. Starnberger See is the second largest lake in Bavaria and the closest one to Munich. Very easy to reach with the S-Bahn, line S6. There are three main S-Bahn stops along the lake where you can get off: Starnberg, Possenhofen or Tutzing. Also: sunbathe, take a dip, picnic, etc. Which other lakes do you know around Munich? Nice post. I mean Germany is not that much popular as a travelling destination. If you are planning to visit Germany then you may take help from the Germany Road Map so as to find your way easily out there in unknown place. © 2015 Blog My adventures in Munich. All Rights Reserved. Simple theme. Powered by Blogger.